Emerald ash borer is coming to an ash tree near you! What is emerald ash borer and why does it matter to you?This small invasive beetle has killed millions of ash trees in the United States and Canada so far. It is making it’s way into Simcoe County and we need to be ready!All North American species of ash (Fraxinus spp. ), which includes white and black ash as well as some exotic ash species, are susceptible to Emerald ash borer. Mountain ash, which belongs to the genus Sorbus, is not susceptible. 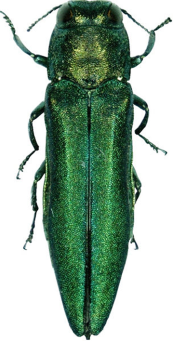 Adult emerald ash borer beetles are a dark metallic green bullet shaped insects that are approximately 8.5 mm in length. They have a flat head with black eyes. The female deposits her eggs individually or in groups in the bark of the ash tree. These eggs will take about 2 weeks to hatch. Once the eggs hatch the larvae bore into the tree and start to feed under the bark until weather gets too cold in fall. Under the bark the larvae create “S” shaped galleries filled with frass (insect poop). The mature 4th instar is 26 to 32 mm long. These mature larvae overwinter and in the spring go through a pupal stage (like the cocoon stage for butterflies). The adults emerge from the pupa and then chew D-shaped hole to exit the ash tree. The adults are capable of flying upon emergence from the tree. The Emerald ash borer is native to Asia and was first detected in North America in 2002. In Canada the insect was first detected in the Windsor area. The insect spread to ash trees in south western Ontario (London in 2006) and had spread as far as Toronto by 2007. The insect continues to spread in Ontario, with infestations found as far north as Sault Ste. Marie and as far east as Ottawa and Frontenac county in Ontario and to Montreal in Quebec. The beetle has been detected on Manitoulin Island and infestations were confirmed in Simcoe County (Bradford, Ontario) at the end of 2013. Control measures were implemented to try and slow the spread of the beetle when it was first detected. A containment zone was set up, regulated by federal ministerial orders, prohibiting movement of potentially infested ash commodities that could spread the emerald ash borer. In locations where the beetle was/is positively identified movement restrictions are put in place which prohibit the movement of all ash materials—such as logs, branches and wood chips—and all species of firewood from the affected site. People who move regulated materials from regulated areas without the permission of the Canadian food inspection agency (CFIA) face fines and/or prosecution. This containment zone is now being enlarged to encompass an area from North of Sault Saint Marie to North of Ottawa and east to Quebec (areas around the Ottawa and St. Lawrence rivers) as of April 1, 2014. This means we in the Orillia area will now be in the regulated area. There are extensive areas with a large proportion of native ash trees that have yet to become infested in Ontario, Quebec and indeed the rest of Canada. The distribution of the emerald ash borer is predicted to continue to expand. It is only a matter of time. In our area, ash trees are an important and common species in our forests, woodlots and in our own backyards. These trees are all at risk. In North America, the emerald ash borer has few natural enemies. Studies have shown that the emerald ash borer damages and kills trees within one to four years of infestation. These studies have also shown that within six years of emerald ash borer arriving in a woodlot, more than 99% of the ash trees in that woodlot are dead. The effects of the emerald ash borer are potentially compounded by invasive plants moving in as a result of the ash tree mortality. The Canadian forest service researchers are investigating the spread (both natural and assisted) and impact of emerald ash borer. Emerald ash borer is difficult to detect at low population levels as in the early stages of an infestation, signs and symptoms are not readily apparent. Inspection surveys of the trees involve looking for the yellowing and dieback of the leaves of the tree. Looking at the trunk of the tree for cracks in the bark and the presence of D shaped holes in the trunk of the tree (exit holes of the adults). Epicormic sprouts (branches growing at the base of the tree) are also seen on infested trees. Once the tree becomes infested the branches and wood become brittle and tend to break off. An effective survey method that is more predictive of early infestation involves sampling branches from the upper part of the tree. In these surveys branches are cut and bark removed to look for signs of the larvae and larval feeding. Is there any defense against this beetle? Some natural enemies, wood peckers and native parasitoids (insect parasites that kill their hosts) and insect pathogenic fungi, may help reduce emerald ash borer populations. Researchers are studying levels of mortality caused by these pathogens and parasitoids, in order to quantify their potential impact. Researchers in Canada and the United States have been studying parasitoids imported from China to battle the emerald ash borer as part of a biological control program. A successful method to protect individual high-value ash trees is to inject an insecticide into the tree. One of the insecticides used is TreeAzin™, formulated from extracts of neem tree seeds. This insecticide was granted full registration in 2012 for use in isolated infestations. This insect has the potential to significantly impact the urban trees, parks and forests in our area. Changes in the regulated area as of April 1, 2014 could affect the rate of spread in our area. So the next time you are out for a walk take a good look at the trees around you.